The philosopher and commentator John Haldane explores a range of issues concerning the condition of Roman Catholicism, its leadership and teachings, and examines the ways in which these connect with, complement, or challenge trends within Western Society. 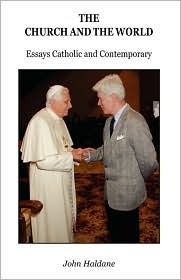 Over the course of some twenty five essays he discusses matters as diverse as the Papacy of John Paul II, the role of philosophy in articulating Catholic teaching, evolutionary theory, Christian humanism, medical and sexual ethics, religious architecture and Catholic schooling. The chapters display the analytical mind of the philosopher, the sensibility of the art critic, and the fluency and descriptive power of the journalist and broadcaster. In the preface he writes: While it would not be accurate to describe my religious outlook as conservative or traditionalist, nor as liberal or progressive, for these are crude oppositions generally lazily applied, it would be generally appropriate to describe it as ‘orthodox’. This outlook informs the chapters even when they are not explicitly concerned with doctrine, as they very rarely are. The Church and the World is wide-ranging, informative, humane and certain to prompt readers to carry on thinking about and discussing the issues. Read The Church and the World. “John Haldane is a Professor of Philosophy whose fame has spread far beyond the walls of the University of St Andrews. In this collection of essays a great cross-section of subjects is introduced in a very stimulating way, encouraging us to think ever more deeply about those things that rea;lly matter”. — Cardinal O’Brien, Archbishop of St Andrews and Edinburgh. “In presenting and enjoyably readable analysis of any question – from the theory of evolution to the possibility of religious architecture – John Haldane unearths the rationale beneath surface appearances, which Greek thinkers called the logoc, the very root and reason of things”. — Christopher Howse, The Daily Telegraph. — Ralph McInerny, University of Notre Dame. “Haldane is a rarity among social commentators: an intelligent, bona fide Catholic layman whose opinion receives frequent public exposure, and whose contribution to public debate is highly valued. … Although loosely grouped, the essays are non-sequential; each is intended as a distinct reflection on a particular topic. As such, this is the kind of book a reader may pick up, open to any chapter, and comfortably read and digest without reference to previous chapters. … Haldane is such an amiable guide, and his elegant prose and delightfully sequential approach make easy what might otherwise be an arduous task”. — Tim Cannon, AD 2000. “A refreshing feature of Haldane’s writing is his avoidance of polarisation or ideology. He argues that both ‘right’ and ‘left’ in the Church (labels which he thinks in any case misapplied here) have focused on externals, whether the liturgy or social action. Meanwhile we have neglected the spiritual formation and devotional life that ought to nourish both theological discussion and practical action. … The vision that Haldane outlines is both coherent and challenging: a courteous but uncompromising call”. — Margaret Atkins, New Blackfriars.